Oxebridge ISO 9001 Template Kit Version 1.10 Released! 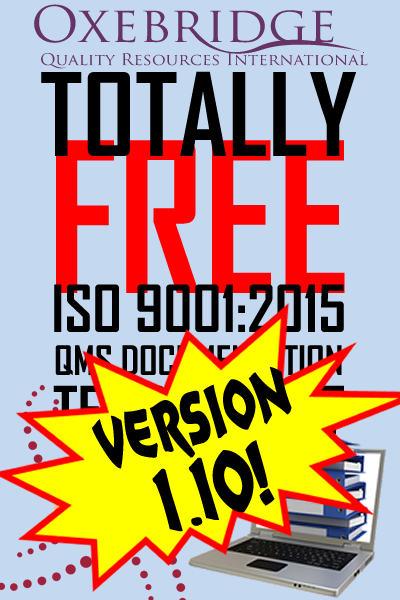 Oxebridge has released version 1.10 of its Totally Free ISO 9001:2015 QMS Documentation Template Kit. The kit provides a full set of customizable ISO 9001 document templates any company can use to build their quality management system, and relies on free software to help populate and customize the documents. Originally released in August 2015, Oxebridge regularly updates the kit to add new features, fix bugs and generally improve the compliance of the kit to the latest auditing methods or preferences. Version 1.10 has been labeled the “Awesome Audit Update,” and provides an entirely new feature, never before appearing in the Oxbeerdg kit: the ability to create customized ISO 9001 checklists for each of your processes, using “Human English” checklist questions derived from the ISO 9001 clause requirements. The Instructions booklet has been updated to provide instructions on how to create separate checklists for each process, and then how to pull the “Human English” questions into each one, so you can simultaneously conduct process-based audits while ensuring you also audit each of the ISO 9001 clauses related to each process. Other edits to the kit include minor tweaks to the COTO Log, CAR Log, Internal Audit Log and more. New users can download the entire kit here, while those only wanting the updated files can browse the files individually here. The Oxebridge kit has always been free, and will remain so. An update to the AS9100 kit is due shortly, and will include the new audit checklists, as well as a “PEAR 2.0” form.